I-Play's Kingdom of the Blue Whale allows you to generate jigsaw puzzles from among over fifty beautiful aquatic pictures from the National Geographic Society. If you enjoy spending time with jigsaw puzzles but would like a more portable solution, you might like Kingdom of the Blue Whale. 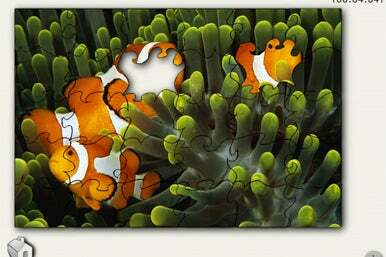 Available for the iPhone, iPod Touch and iPad, this puzzle app is easy on the eyes and easy to understand. From the built-in library of National Geographic photographs or from your own photo library you can create virtual jigsaw puzzles of 6, 20, 30, or 42 pieces. With the multitouch interface, several people can work together to piece together the puzzle as adjacent pieces easily snap together. Once complete, you can share the completed puzzles via e-mail or built-in Facebook integration. I checked out the HD version of the game and enjoyed the larger surface to move around my puzzle pieces. However, as big as the iPad’s screen is when compared to an iPhone, its size is a bit limiting when putting together the more complex puzzles. The virtual tabletop extends beyond the iPad’s screen so you might temporarily lose pieces off the screen. On the other hand, puzzle solving is much easier thanks to pieces that automatically lock together when in close proximity. Don’t stack too many pieces on top of one another since it can be easy to lose pieces that way too. While the photos are certainly beautiful and the descriptions provide a limited learning experience, the game would have benefited from a little more challenge or variety such as time challenges or other achievements to unlock more pictures. Hard-core jigsaw puzzle fans may not take to the virtual experience, but this portable solution has the big advantage of giving you a virtually unlimited set of puzzles for your mobile device.